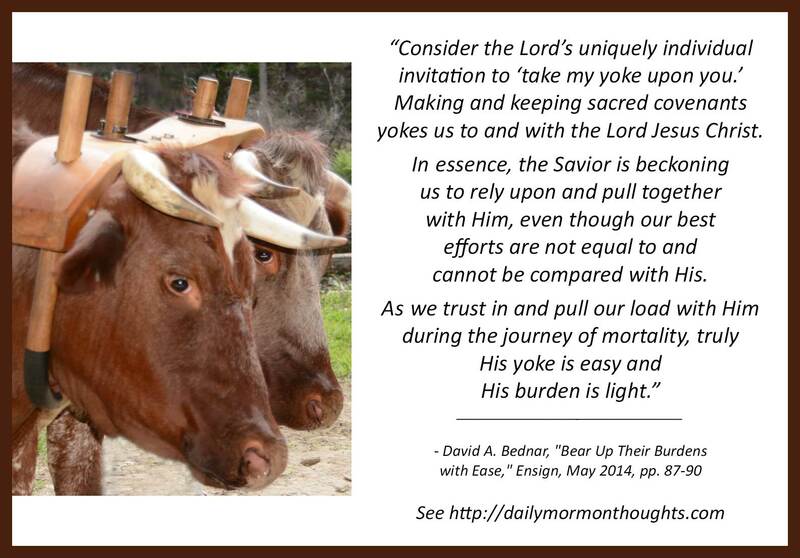 "Consider the Lord's uniquely individual invitation to 'take my yoke upon you.' Making and keeping sacred covenants yokes us to and with the Lord Jesus Christ. In essence, the Savior is beckoning us to rely upon and pull together with Him, even though our best efforts are not equal to and cannot be compared with His. As we trust in and pull our load with Him during the journey of mortality, truly His yoke is easy and His burden is light. "Note the centrality of covenants to the promise of deliverance. Covenants received and honored with integrity and ordinances performed by proper priesthood authority are necessary to receive all of the blessings made available through the Atonement of Jesus Christ. 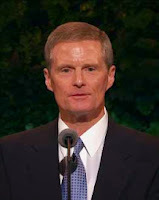 For in the ordinances of the priesthood, the power of godliness is manifest unto men and women in the flesh, including the blessings of the Atonement (see D&C 84:20-21)." We yoke ourselves to the Savior through making sacred covenants—and through keeping them. That is a key concept for discipleship. He will pull with us, pull for us, as long as we join ourselves to Him by our commitments, our covenants, and our behavior. Then, we need never be alone through any of life's challenges; "heavenly help" is with us, and we may rejoice in the assurance. It truly does not matter how heavy our burdens may appear to us, because His "yoke is easy" and His "burden is light." Though our best efforts will never match his, the act of being yoked means our burden too becomes light. What a profound and sacred blessing! I believe what he says is very true. Life is more happy when you are yoked to our Savior Jesus Christ. Your have your heavy burdes lifted. I testify to you that this is true in the name of our Savior Jesus Christ Amen.